I find the ubiquitous “best restaurant in the world” lists hard to stomach (pun intended). What does that even mean? Does the restaurant have to be French in order to qualify as best in the world? (You might think so, given Michelin’s still-strong influence on our luxury dining industry). What if the best restaurant in the world were the tamale lady down the street from you? What if the best restaurant in the world were your grandma’s kitchen, with the magical tools your grandma’s weathered hands that had practically memorized how to make dumplings in her sleep? See, these ratings are far too subjective. But if you were to ask me where you could find the best tasting menu in the world…one with the most interesting little bites and the most theatrical, exciting presentation…that would be an easy request for me to answer, after I first asked you to clear your calendar and wait for your year-end bonus: Grant Achatz‘s Alinea, in Chicago. SURF CLAM (sunchoke, cucumber, lilac): This was so deconstructed that I have little idea of what it was that I ate, but it was all very compelling. Light little bites – some extremely intensely-flavored, others creamy/mysterious/foamy. STEELHEAD ROE (english pea, olive oil, chamomile): This dish came with eucalyptus smoke! It tasted like we were running through a meadow in Iceland bordering a volcano. GRAFFITI (spring through the concrete): A server came and sprayed our plates with “graffiti” before we dove in. We were able to unearth treasures (like lima beans) from below! Also, I’d like a huge bag of that truffle meringue to snack on, please. LILY (aji amarillo, jackfruit, mocha): A fragrant and tropical dish. The lily and jackfruit added pungent, funky notes. EGGPLANT (banana, cocoa, curry): Waiter, there’s some table decor inside my soup. Crunchy cocoa nibs, hot aromatic broth, tender eggplant. CRAB (rice, green curry, cilantro): Teeny-tiny savory bite. TAMARIND (young coconut, nam prik num): A strong contender for best caramel ever, in my book – which is saying a lot because I love caramels. Maybe the world is ready for a tamarind caramel with an added funky/savory note. SIAM SUNRAY (lemongrass, chili, soda): Light, tangy puff. PERCEBES (smoke, seawater, ash): A pile of artfully arranged seaweed topped with barnacles, which were deliciously briney and a bit less chewy than a clam. TORORO KOMBU (smoked foie gras, ice fish cracker): A single crispy, creamy, savory bite, with a palate-cleansing shooter that tasted like celery. HAMACHI (shishito, bean, pine branch): The servers offered us the option of eating this raw or grilling it. Grilling it added so much flavor from the char, and also from the pine branch. PORK BELLY (parsnip, black trumpet, kombu): This was a fun surprise. What we thought were chunks of charcoal in the beach fire for the previous dish turned out to be chunks of pork belly wrapped in kombu! On a gorgeous black tree slab, the servers plated fire-warmed pork and slices of parsnip along with black mushroom purees. It all tasted quite sweet, intensely mushroomy, and very Asian-inspired. HOT POTATO (cold potato, black truffle, butter): “This is the most time-sensitive dish,” they told us. We were instructed to eat it all in one bite. A generous slice of black truffle, potato, and then a square of what tasted like parmigiano-reggiano. RABBIT (morel, ramp, mastic): Rabbit served three ways on a redwood log with ferns. I finished the rabbit liver mousse last, so that the earthy taste would linger in my mouth. TROPICAL FRUIT (rum, vanilla, kaffir lime): The table became our communal plate, and an fantastical display of pressed fruit chunks, candy, coconut snowballs, and other sweet goodies were artistically scattered on the table. 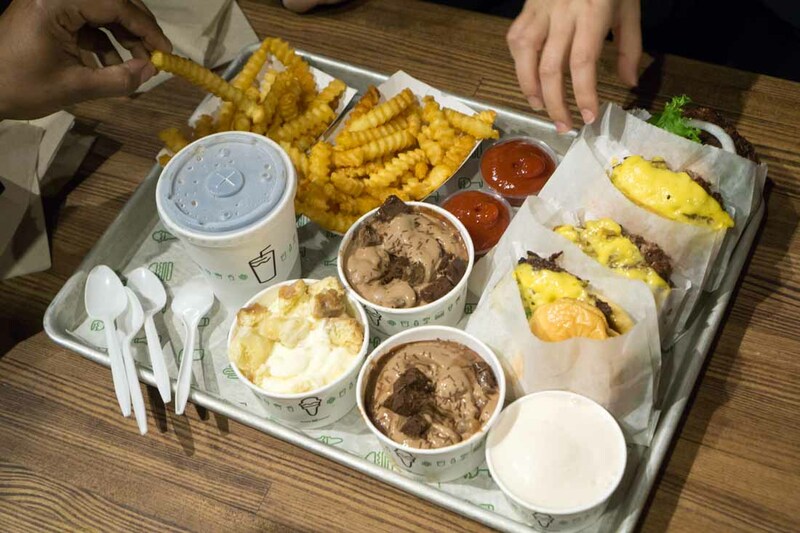 After our amazing dinner, we were full but not stuffed (my favorite way to feel after dinner, because such a state allows for additional snacking)…so our group of four decided to reconvene a few hours later for Shake Shack burgers, fries, and frozen custards. Our post-Alinea snack of Shake Shack burgers, fries, and frozen custard. Upon our return to Los Angeles, I tried to brainstorm ways to incorporate some of the innovative flavor pairings we enjoyed at Alinea into dishes that were easy to make at home. 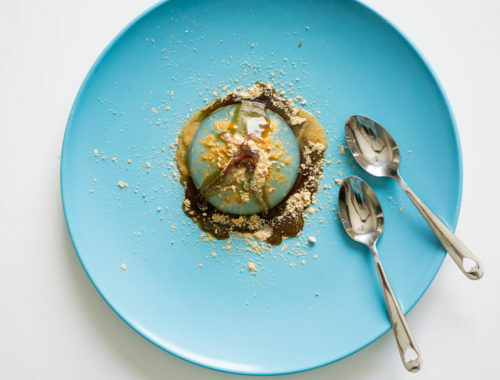 I couldn’t stop thinking about the tiny square of tamarind caramel that exploded with flavor, so I decided to make a version that would always remind me of our fun and delicious meal. 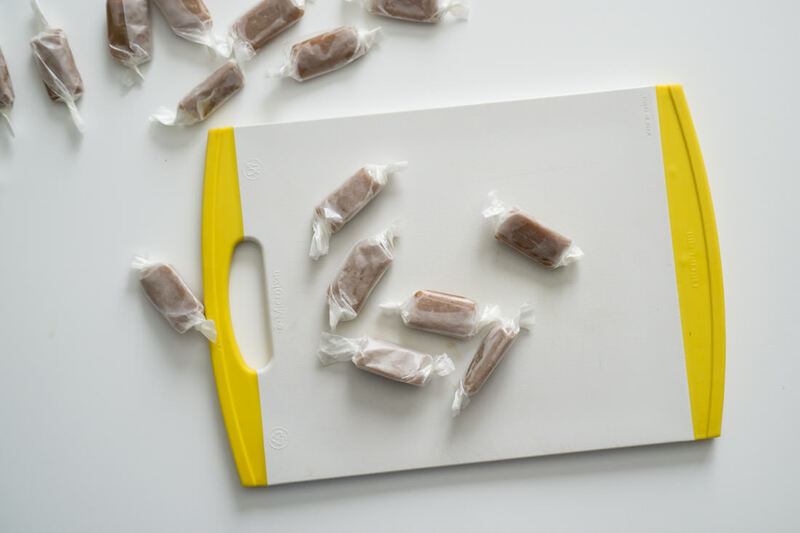 Savory, tangy, and spicy, these caramels are an interesting tweak of the classic chewy vanilla caramel we all know and love. 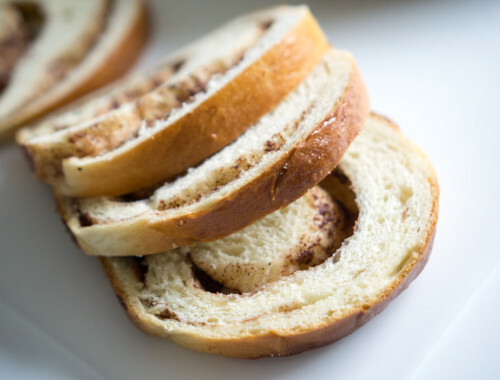 The first bite is all-American butter and vanilla…and then the mouth-intriguing salt, sour, and spicy notes emerge. 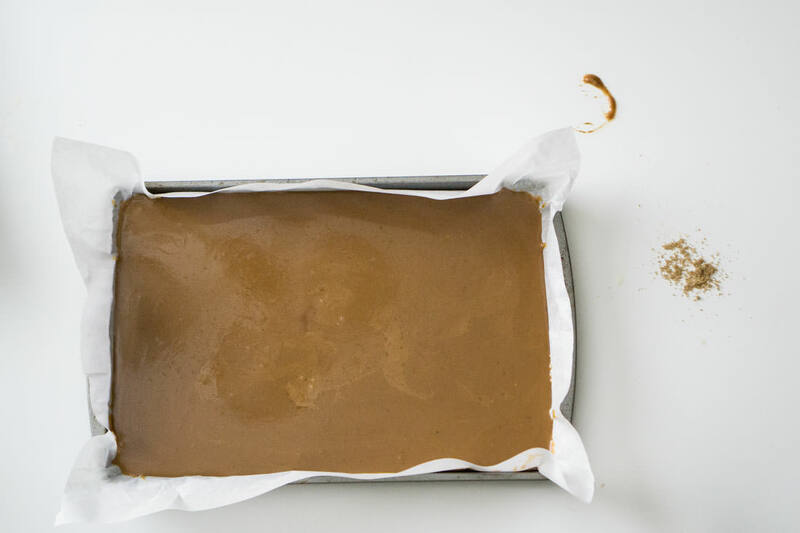 These caramels are totally addictive – make them for your holiday table or for gifts, and I promise you they’ll be gobbled up immediately. If you’d like to push the envelope even further, feel free to approximate Alinea’s use of the Thai spice mix nam prik num by adding a couple of drops of fish sauce (naam pla or the Vietnamese nuoc mam), which will further heighten the sweetness of the candies with the contrasting savoriness of the fish sauce. But the non-fishy version is plenty delicious, too. Place the tamarind pulp in a small bowl with 1/2 cup of hot water and let sit for 15-20 minutes. When the pulp-water mixture is cool enough to handle, break up the pulp in the water with your fingers, squishing it until the pulp breaks apart. You will probably also find some tamarind seeds in the pulp. Push the tamarind pulp mixture through a small sieve into another small bowl. You will end up with about 1/2 cup tamarind paste. 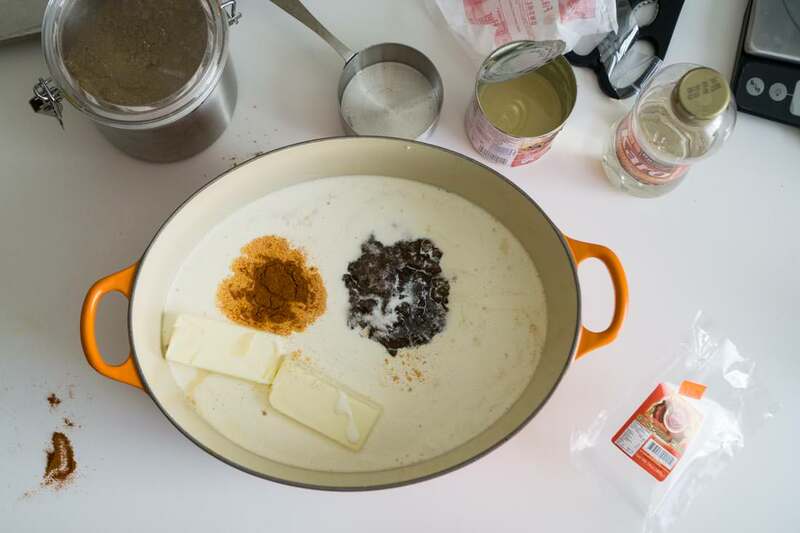 In a 5-quart to 7-quart pot, combine tamarind paste, sugar, brown sugar, corn syrup, cayenne pepper, salt, nuoc mam (fish sauce) (optional), evaporated milk, heavy whipping cream, and butter. 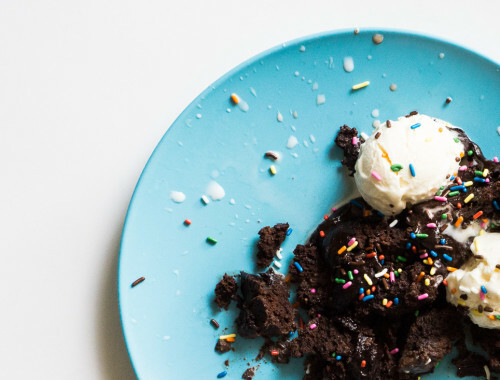 Monitor the heat of the mixture with a candy thermometer while stirring. When the thermometer reaches 250 degrees F, remove the pot from the heat. Stir in vanilla extract. Transfer mixture to the parchment-lined pan, let the mixture cool completely, and refrigerate. 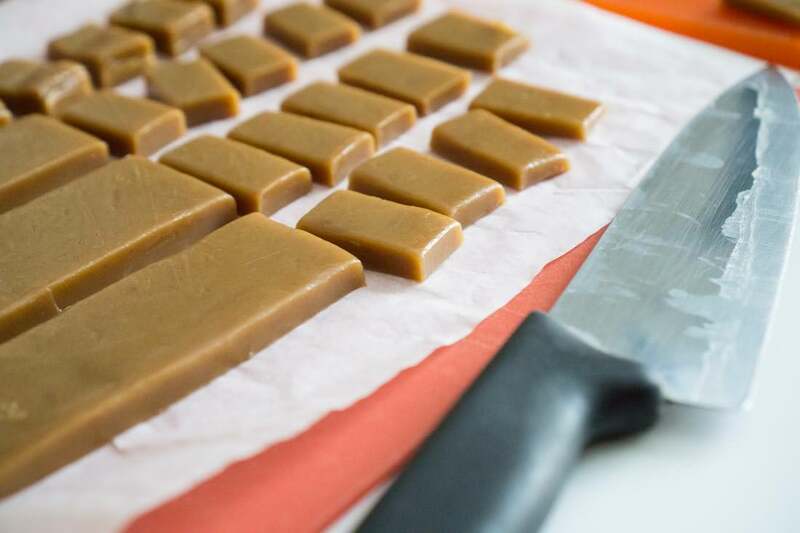 When cooled, cut the caramel into small squares and wrap the squares in parchment paper for storage. TAMARIND: I've seen at least two kinds of tamarind pulp blocks: dry and wet. For this recipe, I used the wetter tamarind pulp, which happened to be from Thailand (the drier one was from India). POT: It's important to use at least a 5 quart pot because you don't want the boiling candy mixture to boil over. WRAPPING: Caramels should be wrapped in parchment squares or cellophane, rather than the standard waxed paper. 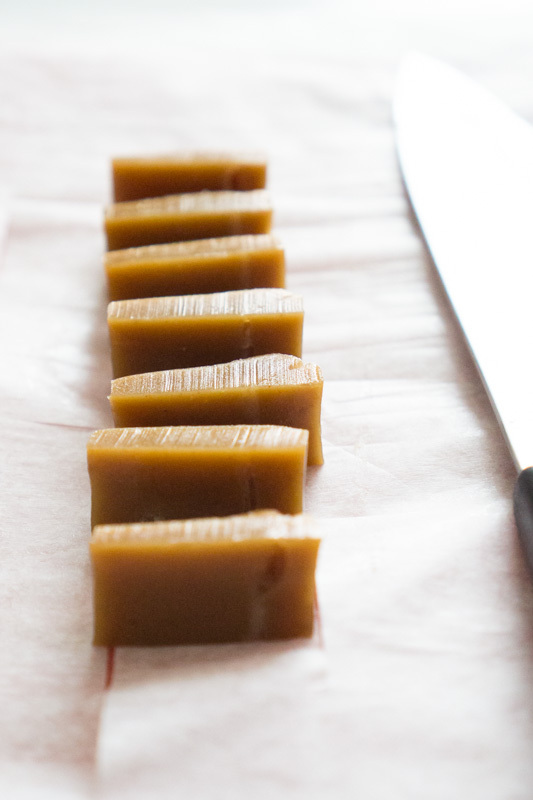 It can be a pain to cut the parchment, but waxed paper really sticks to the caramels.